Ensure your important business documents are recorded accurately. Owl Time Clock’s Rapid Print Automatic Time Stamp provides a simple method of recording time and date on office materials and verifying the receipt of items such as incoming mail, receipts, invoices, work orders and other pertinent business documents. 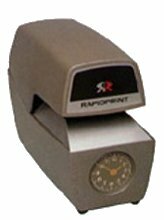 Rapid Print is not only a quick and efficient time recorder, it is easy to use. Simply insert a form or letter and it’s instantly printed with the time and date. With Rapid Print, you’ll always have an easy-to-read, accurate record of information on all your business materials. Rapid Print’s unique Adjusta-Print electronic circuitry allows it to provide consistent, clear imprints on all types of forms. The durable construction of this time recorder—a rugged steel housing, stainless steel paper plate and sturdy case lock to prevent tampering—ensures that Rapid Print remains the only timestamp solution you’ll ever need for your business. Owl Time Clock’s 4700 Automatic Time and Date Stamp provides a simple method of recording time and date on office materials and verifying the receipt of items such as incoming mail, receipts, invoices, work orders and other pertinent business documents. The 4700 is not only quick and efficient, it is easy to use. Simply insert a form or letter and it’s instantly printed with the time and date. The 4700 has adjustable print positions and can be equipped with upper and lower engraved inscription plates. It is also available in a consecutive numbering format — model 4800. 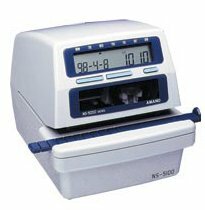 The NS-5100 heavy-duty electronic time and date stamping machine has the flexibility to accommodate any time/date stamping application. 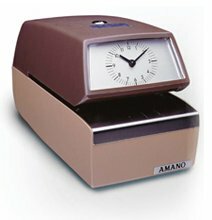 This clock features programmable print size capabilities for a wide range of needs, and has an adjustable print position stopper and side guide for easy foolproof alignment. The user-friendly NS-5100 Series requires minimal attention, allowing employees to focus on other priorities.